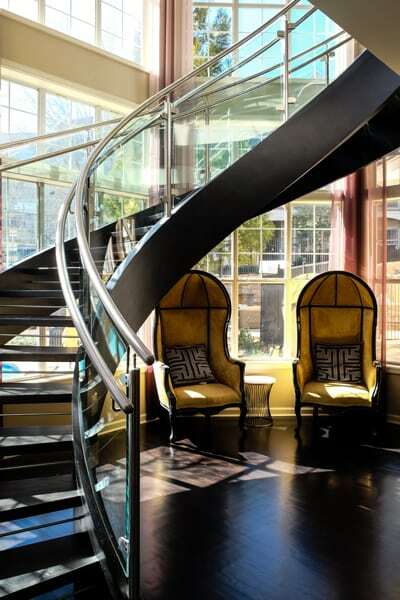 Custom curved stairs are sleek and elegant, providing a seamless transition from one floor to the next. Today, we take you through the process of designing and constructing a contemporary round staircase. 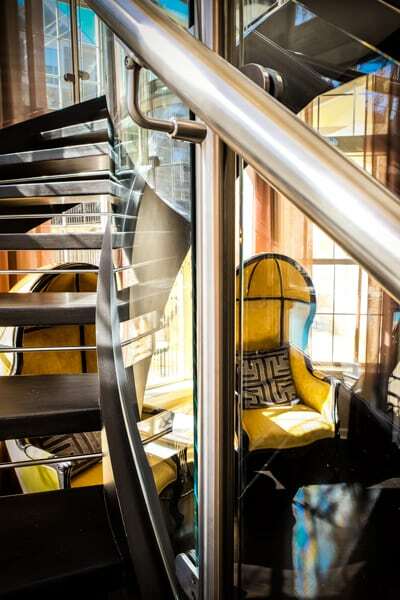 Built for an apartment complex clubhouse in Alpharetta, Georgia, this staircase showcases modern design at its best. The first phase of a curved staircase project starts with inspiration. 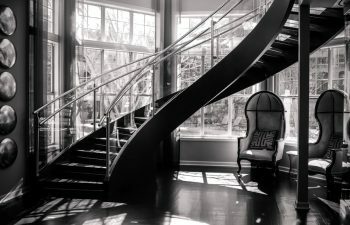 What is the client’s design preference, and what is the ultimate goal of the curved stairs build? In this case, the property management group was seeking an updated clubhouse look to appeal to current residents and prospective tenants. The firm enlisted our team to help transform the traditional clubhouse into an inviting, modern space for residents and guests to enjoy. The clubhouse’s two levels were being completely renovated and the décor updated throughout. Through discussions with the client, our team learned that they were inspired by contemporary styles, materials with a high-end impact, and designs promoting open space throughout the building. Once the project has been identified and inspiration discussed, our creative design team begins to draft concepts and models for the perfect round staircase to enhance the space. Struck by the beauty of the large windows in the clubhouse, our design team developed plans for a custom, curved staircase to follow the same curve. Once the design phase is complete and the client has approved all drawings, it is time to begin constructing the curved stairs. 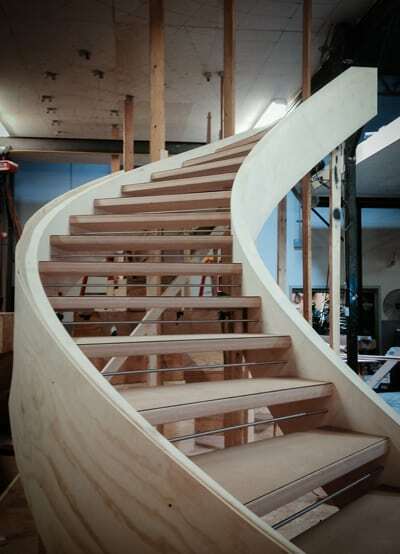 When building a commercial or residential curved project, we manufacture the stairs in our state of the art facility. Our talented curved stairs team uses advanced equipment to bend stringers to the desired curve to ensure a perfect fit upon delivery. Below, you can see the unfinished clubhouse open riser stairs during the manufacturing process in our facility. Built for aesthetics as well as lasting quality and durability, this commercial, open riser stair features. To complete this commercial stairs project, our craftsmen design and construct the handrail system. The handrail is typically constructed within our facility and “pre-fit” to the stairs for a streamlined installation process. Curved glass panels are visually stunning. Combined with the open rise design, the stair offers a modern, airy feel. Often considered the essence of contemporary appeal, stainless steel was selected for the round newel posts and the staircase’s guard and grab rails. Visit our curved stairs and glass and stainless steel project galleries for additional details and pictures on our exquisite projects. From inspiration to installation our team is committed to designing and building the highest quality commercial stairs. Our reputation speaks for itself and client satisfaction is our highest priority. Contact us today to discuss your next curved stairs project.